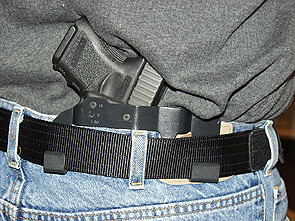 You’ve decided that you should start carrying concealed, but aren’t sure where to start. Do you need a permit? How easy is it to get a concealed carry permit? Do you need to take a training class? How much does it cost? Although each state is different, there are some basic steps you can follow to determine how to get your concealed carry permit. You will likely need a permit, but there are a few states that are considered “Constitutional Carry” or Unrestricted, because you don’t need to have a CCW permit. Click here to find out if you need a permit in your state. Most states have mandatory training requirements in place. In most states, you will need to take a firearms safety or training course to prove your proficiency with a handgun. There are a few exceptions, but in most cases you’ll need to take a concealed carry class. Click here to find your state’s course requirements. Classes vary by company and by state. Most involve classroom time, some involve live-fire on a range, and some are even available online. Be sure to choose the course best for you, and consider doing more training than what is required by law. You can never know too much or be too good when it comes to defending you and your family from threats. After you have found out if you need to take a class to get your CCW Permit, register for one and complete it. In most cases, you will need to show proof of completion when you fill out your application. This is vital. It is very necessary to learn all of the laws regarding concealed carry to make sure you do not do anything illegal, because there can be big consequences. You may have already learned most, if not all, of the laws at your concealed carry class. However, if you didn’t learn them all, or if you didn’t take a class, be sure to check your state’s legislation so that you have all the facts. This can usually be accessed online, but you can contact your local issuing authority or your state representative for more information. In most cases, you’ll now be ready to fill out your application. It is mandatory to fill out your application at the local sheriff’s office in some states, but other states allow you to fill it out online, or to print it off at home and send it in to the issuing authority. To find out more about this, check out your state’s page one more time. Be completely open and honest in your application. It will be checked for accuracy and it will do you no good if you are found to be lying on your application form. Come prepared with all necessary documentation and information. To find out more, please make sure you call or visit your local issuing authority to find out exactly what you will need in your state. Remember that in most May-Issue states, you will be required to provide a ‘good reason’ for why you want to carry concealed, and in most cases “self-defense” is not a good enough reason. Many May-Issue states make it difficult to get a permit and may only issue permits in very rare cases where you can prove your life is in danger and you are doing everything else in your power for self-protection already. Be aware and be prepared with your reasoning for wanting to carry concealed. After you’ve completed your application, you’ll need to pay a ‘processing fee’ of sorts. This varies in cost, but depending on the state can be as low as $5 or as high as $100+. Make sure you have asked the issuing authority what type of payment they accept. In a lot of states, you will be fingerprinted when you apply in person. This usually carries an additional cost but is generally around $10, though this cost varies by state, too. If there is anything else you are required to do, ensure that you follow through on this. Sometimes you are required to take training after your application, sometimes you have to follow up with another form. Make sure you ask when you apply. If your application process went off without a hitch, you will now have to wait for a response. There are usually legislated timelines for how long a response can take, though in many states, responses are taking longer due to the increase in applications. As long as you have done everything correctly and meet all of the requirements, there is a good chance you will obtain your concealed carry permit! If you are not approved, find out exactly why. If it was something in your application or training that didn’t meet the requirements, address the issue and try re-applying. It could, however, be that you didn’t meet all of the requirements and are ineligible for a concealed carry permit. Hopefully this isn’t the case, but be prepared. Now that you have a concealed carry class, keep in mind the responsibility that goes along with it. You owe it to your community, your family, and yourself to be the best you can be with your firearm. Keep up on your training. Ensure you don’t print or brandish. Always be vigilant. You may be required to take further training to renew your permit. Once again, click here to find your state and see if there are any special requirements for renewal. If you move, have a change of address, change your name for any reason, or have any other alterations to make to your permit, make sure you do so immediately. Check with your local issuing authority to find out how to update your permit information. In some cases, your permit can be invalid if it is not kept up to date.